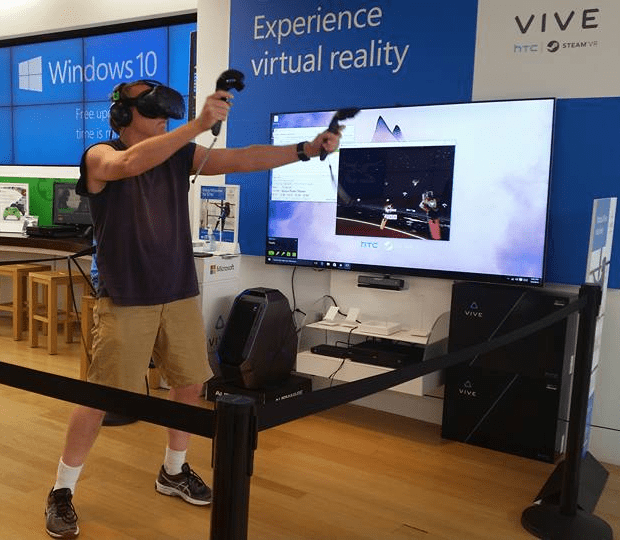 If you have a Microsoft Store near you, I suggest you go ask for a demo of the VIVE VR system. It's about 10 minutes. This is worlds beyond what I thought was capable in VR at this time. It is immersive. It is terrifying. When you see a whale on screen it's a whale. When one swims past you in VR it's A WHALE. A HUGE FRIGGIN WHALE. There was no mistracking, no frame problems, nothing. You truly believe the existence of the situations the put you in. The demo runs several bits of software for you, including a simple shooting game, and a very astounding three dimensional painting program. And you will look like a dork. Ha! I look like a dork already, so that doesn't faze me a bit. I've heard a lot about the oculus rift. I wonder how they compare? This blows the rift to tiny pieces. The rift is uncomfortable and has slight tracking issues. I was just watching this video on Steam about VR. It looks like a lot of fun, but at $800 I will wait. but at $800 I will wait. And you will also need a video card of at least that much to support it. I never wanted to shoot a whale until just now. My brother has one of these, and brought one over the other day. He was showing me this video, and there I was, happily looking the other way at the ship, just chilling. I turn around and about have a heart attack with the huge whale there where it hadn't been there a minute or so prior.